The V (3557-3559 Georgia) Makes It Past BZA Process | Park View, D.C.
For those wondering what the outcome of the January 15, 2013, Board of Zoning Adjustment (“BZA”) hearing on 3557-3559 Georgia Avenue (“The V”) was, I finally have that answer. BZA did not make a decision until February 12 and sent me a copy of that decision on Friday. 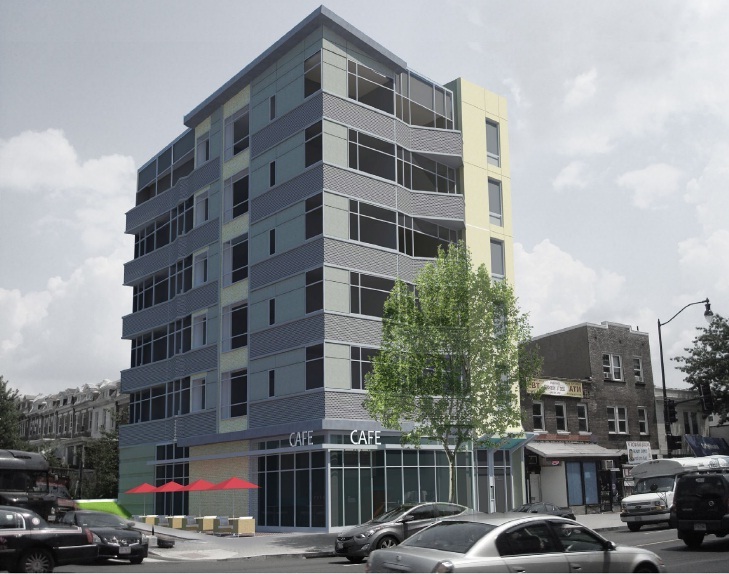 The long and the short of it, “The V” has passed the BZA process with the support of ANC 1A, Councilmember Graham, and the Office of Planning. It can now move forward. You can also become more familiar with the project by reviewing the presentation materials from the January 9, 2013, ANC 1A meeting. The District Department of Transportation (“DDOT”) submitted a memorandum, dated January 8, 2013, stating the Application has a negligible impact to the transportation system and that the agency had no objection to the requested variances provided that the Applicant installs a minimum of 20 bicycle parking spaces and implements the recommended transportation demand management (“TDM”) measures. A member of the property management team will be designated as the Transportation Management Coordinator (TMC). The TMC will be responsible for ensuring that information is disseminated to tenants of the building. The TMC shall provide a packet of information identifying programs and incentives for encouraging retail and residential tenants to use alternative modes of transportation. The packets shall include information regarding Capital Bikeshare, ZipCar, Commuter Connections Rideshare Program, Commuter Connections Guaranteed Ride Home and Commuter Connections Pools Program. Links to CommuterConnections.com and goDCgo.com shall be provided on the property management websites. The Applicant shall provide at least 20 bicycle spaces in the building. Convenient and covered secure bike parking facilities shall be provided. The Applicant shall provide the first occupant of each residential unit, upon closing of a sale or signing of a lease: a car sharing membership at a value of $100.00, or a Capital Bikeshare membership at a value of not less than $150.00; or a Smart Trip card at a value of not less than $200.00. There shall be no permanent garbage dumpster in the rear yard. With car sharing membership one of the options included in the TDM measures, it suggests to me that converting some of the parking meters on Otis Place for Zipcar use would make a lot of sense. When I meet with Zipcar to discuss their plans to increase service in Park View, I’ll be sure to discuss this potential location. This entry was posted on February 25, 2013 at 2:01 am and is filed under Development, Housing. You can subscribe via RSS 2.0 feed to this post's comments. Does the zoning variance/approval exclude this development from the RPP program? If not, residents of this building will be able to apply and receive permits. I ride my bike to work nearly every day, but I am not a fan of this cities strategy to force everyone into bikes by making it inconvenient to own a car. When I was chair of ANC1A I had a meeting with Gabe Klien (former head of DDOT) and Harriet Trigoning (OOP) where I commented “the best way to get people to use mass transit is to make it more convenient and faster”, but Gabe Klien totally missed my point and went off talking about how they will time the street lights during certain hours to make traffic move slower. My take is they are intentionally making it harder and less desirable to own are car. I think they are just making it less desirable to live in the city. I don’t know how OOP feels about Mr. Kliens strategy, but they seem to be supporting it. I know he is the DDOT director in Chicago now were he is doing the same thing. Thanks for the update, Kent, and especially the last paragraph regarding Zipcars. What is the time table for construction? If one is available? Also, how do those residents who live directly behind the proposed building feel about the loss of sunlight, etc.? This is great for the neighborhood but if I lived next door and lost natural light I would be a tad upset. Mainly because sunlight in a DC rowhouse is at a premium unless you live along Park Place. Any clues as to the “bodega” or diner which will be on the ground floor? I don’t think refusing to subsidize parking = forcing everyone onto bikes. If you want an easily accessible parking spot, pay for one. Who said anything about subsidized parking? There are a required number of parking spaces for buildings, but developers keep getting waivers so they don’t have to build them, thus making it difficult to own a car. I have a driveway and garage, so I’m covered but I do hear all the complaints about people not being able to park. It makes it difficult for people who have lived here a long time who need the space on the street, as you add more density it will only get worse. It’s only difficult to own a car if you expect someone else to subsidize the cost of ownership, i.e. the city to provide you with free street parking. One of the reasons that DC is so desirable is that we refuse to give huge chunks of the city over to vehicle storage. I concur with Cliff on this one… living without a car is a nice idea, but there are lots of valid reasons to own a car in DC and doing so shouldn’t need to incur excess expense. We need true multi-modal transit options, and cars should be part of the mix. Cars are already the dominant transportation mode in DC. I’m not sure how trying to make the roads more accomodating to other uses equates to taking away the option to drive a private car. You might not be able to park directly in front of your house in the public right of way anymore, and you may have to share the road with other uses (buses, bikes, etc.) and it may take you two minutes longer to reach your destination, but you still have that option. The “free space” outside someones house is paid for by a specific impact fee, and then yearly via property taxes and car registration fees. Granting developers waivers is just poor planning, and an overburden to tax payers because chances are people who move into those building have buy cars. I agree with you that biking, walking, and metro are great options for transportation (along with cars), though. So property taxes fund road construction? The renters in that building will be paying the landlord’s property tax, so why shouldn’t they have the same right to park on the street? People parking their cars on the street overburdens taxpayers? I don’t see the connection. RPP fees (what I assume you mean by ‘specific impact fees’) are comically underpriced. For $35/year I can leave a car on the street 24/7. I’d be willing to bet a lot of money there’s not an equivalently cheap option at any other parking facility in the city. One might even say that the city is subdizing parking by keeping the RPP price so low. JS, they should, but they are getting a special privilege that others have had to provide….thats what the waiver on the parking requirement is. Good night. The developer seems to have asked for a waiver on the parking minimum requirement, that is a far cry from the city having a policy to make people not have cars (incidentally, nearly 40% of residents don’t own cars). In fact, I would like to see more developments in the area get rid of parking requirements. We can reserve space for parking on streets and the like, but we need not require every development to have parking. The costs of providing parking on this small site would have likely been very high to the number of units and that would have the non-car owners in the building likely subsidizing the car storage residents as well as driving up the overall cost of housing. Parking minimums increase the cost of housing by forcing the developers to generally provide expensive underground parking. By eliminating parking minimums they are bringing down development costs which will hopefully be passed on in the form of lower rents/sales prices.